Check out our new tool – On-page audit. It allows users to quickly analyze how well a certain page is optimized for a certain search query as well as reveal optimization errors via deep and detailed page audit. What is a business value behind this tool? Significantly saves time. Within a few minutes you will have a detailed report on how well the particular page is optimized as well as get a list of required fixes and recommendations. Provides the most detailed and comprehensive analysis of the page. 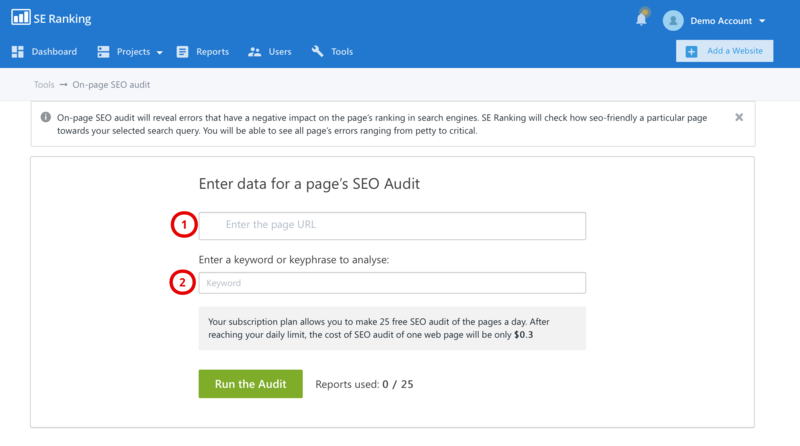 The on-page audit comes with a deep analysis of how a certain page is optimized for a certain search query; finds out whether the page complies with the ranking factors; checks content (including scanning for the uniqueness) as well as technical errors while providing a list of the elements that require optimization. The audit of a particular page usually takes a lot of time and effort. The results, however, are not always complete or accurate. With SE Ranking On-page audit you will get the most detailed analysis in about 2 minutes. keyword or phrase for the analysis. Once the audit is complete you’ll be given a report. In the report you’ll see a detailed description for each of the tasks you need to perform to comply with the latest search engines’ guidelines. 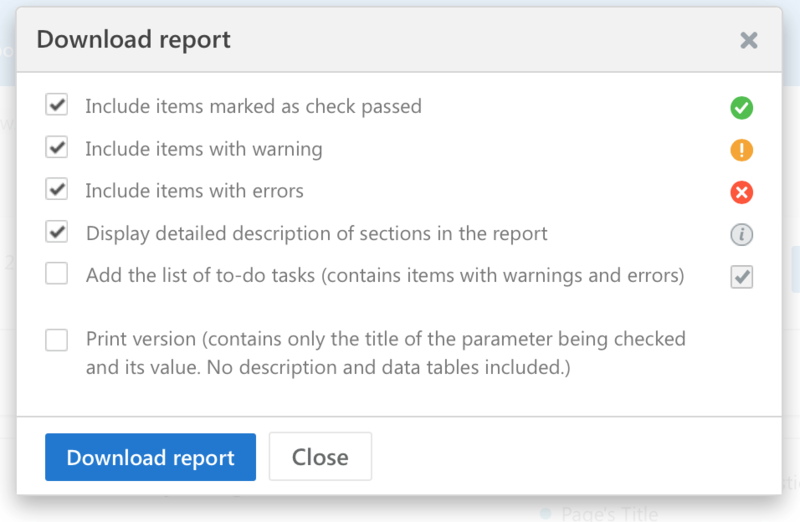 You can save the reports to track the progress of your optimization, or see where you are at any given time with an instant audit real time. You may customize the report, add your corporate styling, export it (if needed) in the PDF-format and send by email to your clients, presenting it as your own. backlinks, outbound and internal links and their statuses (DoFollow и NoFollow). webpage usability: enabling favicon, presence of the mirror, Robots.txt file, XML sitemaps, rel = “canonical” attribute, and safe browsing. The tool is fast and cost-effective and allows users to run audit as often as needed while tracking the progress on the way. The progress report reflects how well the page complies with the search engines’ requirements, and includes the list of open and closed tasks and the history of changes made during the optimization.